Pisto — Spanish (in particular, Basque) dish of tomatoes, onions, eggplants or courgettes, green and red pepper and olive oil. 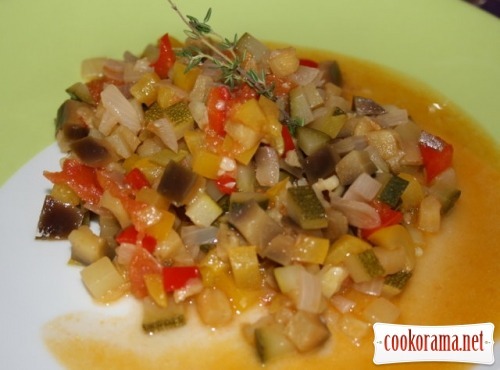 It is similar to ratatouille and usually served warm with scrambled eggs and bread. It is also used as a filling for a pie. Cut sweet red pepper in 4 parts, remove seeds, then wrap in foil and bake in the oven at 180℃ for 20 min. Put it wrapped in cold water. Once it cools, peel it and dice. Make cross-cut on tomatoes and pour with boiling water, peel and dice. Also dice eggplant, courgette and onion. Fry in pan in olive oil (5 tbsp) at first onion, then add eggplant and stew for 15 mi, then add courgette, pepper and tomatoes. Salt, pepper and stew for 20 min. Before serving decorate with rosemary spring.